Staff have the option to apply Z39.50 login credentials to each Z39.50 server at different levels of the organizational unit hierarchy. Credentials can be set at the library branch or system level, or for an entire consortium. When credentials are set for a Z39.50 server, searches of the Z39.50 server will use the stored credentials. If a staff member provides alternate credentials in the Z39.50 search interface, the supplied credentials will override the stored ones. Staff have the ability to apply new credentials or clear existing ones in this interface. For security purposes, it is not possible for staff to retrieve or report on passwords. 1) Go to Admin → Server Administration → Z39.50 Servers. 2) Select a Z39.50 Source by clicking on the hyperlinked source name. This will take you the Z39.50 Attributes for the source. 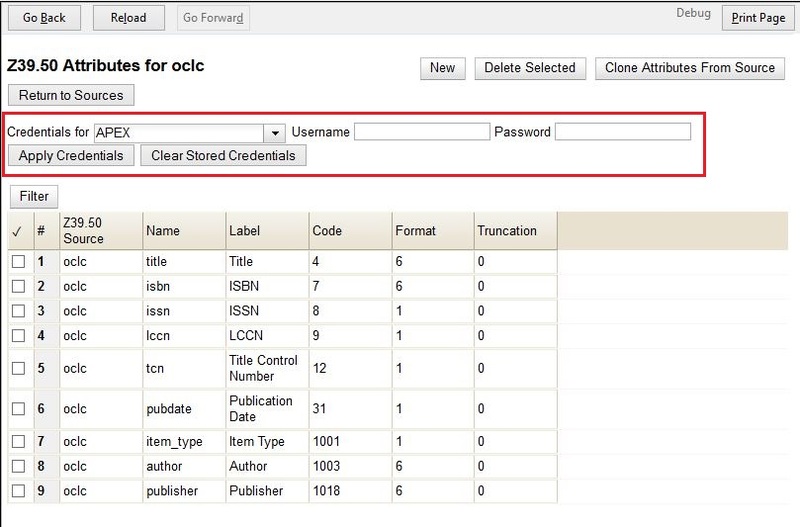 3) At the top of the screen, select the org unit for which you would like to configure the credentials. 4) Enter the Username and Password, and click Apply Credentials.